Built-to-Stock: Our components are built-to-stock, not built-to-order, saving you money. We provide a custom product without the custom price tag. 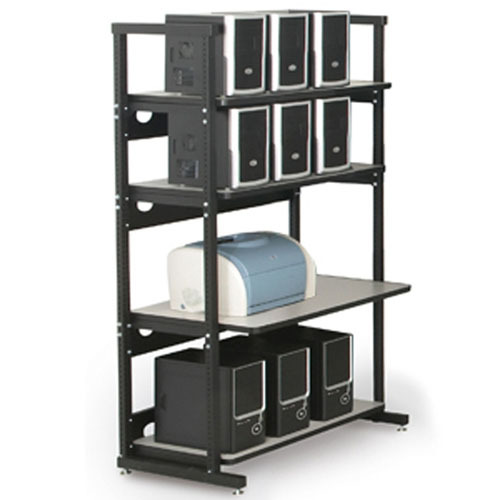 Numerous Parts for Maximum Use: This LAN station includes three 24” deep shelves, one 30” deep shelf, two side frame kits, four shelf support kits, and four 36” back plates. Each shelf adjusts in 1” increments. Quick Assembly Time: Assembly time is less than 30 minutes so there’s minimal waiting time to have your Performance Plus® LAN Station up and ready. Stunning Finish: The White Nebula laminate is accented with black rubber T-molding, which compliments the black powder coat finish of the frame, back plates, and shelf supports. Overall, this LAN station has a sleek and clean finish to compliment any office or IT environment.